The forgotten subject of modern times - the subject of the devils - we have stopped believing in the devil. 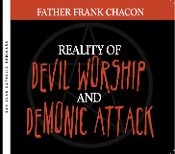 Father Chacon explains how not believing in the devil is a contradiction since Christ came to undo the works of the devil. His discussion centers on examples in Holy Scripture and modern times. The devil is looking for the innocent. Devil worshiping cults target the young, offering them things to cure their boredom. Parents should be aware that these cults are everywhere not just in big cities. Father Chacon encourages parents to watch their children, to educate themselves on the signs of devil worship, and to prepare themselves and their children using holy objects, such as the St. Benedict medal and holy water.